Robert Kirkman is an American comic book writer. 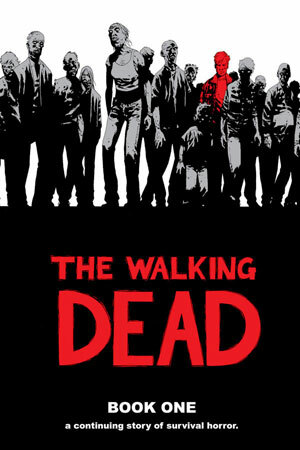 He is best known for his work on Image Comics' series The Walking Dead and Invincible. Kirkman's first comic book work was self published, through the publisher Funk-O-Tron. This series was Battle Pope (2000) produced with artist Tony Moore, an intentionally offensive super-hero parody. While pitching a new series that would be titled Science Dog, Kirkman and artist Cory Walker were hired to do a SuperPatriot miniseries for Image Comics. While working on that book, a pitch was made by Kirkman and co-creator E.J. Su for a new ongoing monthly series named Tech Jacket (2002). The pitch was accepted by Image, but was canceled after only 6 issues, due to low sales. In 2003, at the request of Image Comics, Kirkman and SuperPatriot artist Cory Walker created Invincible for a new "superhero" line. The story surrounded the adolescent son of the world's most powerful super-hero, who develops super-Powers and starts his own career as a super-hero. Walker later failed to meet the grueling deadlines of a monthly title and was replaced by Ryan Ottley. Shortly after the launch of Invincible, Kirkman and Tony Moore began The Walking Dead (2003), an ongoing series set in a world inspired by George A. Romero's zombie movies. Moore, struggling to keep deadlines on interior art was replaced by Charlie Adlard, beginning with issue #7. Moore continued to do covers for the book, however, and eventually became one of the most popular cover artists in comics, even being nominated for an Eisner Award. These two series have met with critical and commercial success, with Kirkman's work on Invincible especially opening the door to more mainstream super-hero work at Marvel Comics. His work for that publisher has included work on a new Sleepwalker series that was cancelled before being published, the first issue eventually included in Epic Anthology #1 (2004). He soon became a mainstay at Marvel, writing, amongst others, Captain America Vol.4 #29-32 (2004), Marvel Knights: 2099 (2004), Jubilee #1-6 (2004), Marvel Team-Up Vol.3 #1-25 (2005), Fantastic Four: Foes #1-6 (2005), Marvel Zombies #1-5 (2005-2006), Ultimate X-Men (starting with issue #66), and The Irredeemable Ant-Man. Paramount Pictures has announced that they have bought the rights to produce an Invincible feature film, and that they have hired Kirkman to write the screenplay. It was recently announced the Kirkman and artist Jason Howard would be starting a new ongoing series for Image entitled "The Astounding Wolf-Man" on May 5, 2007, on Free Comic Book Day.